Cut beef and pork into 3-inch pieces. 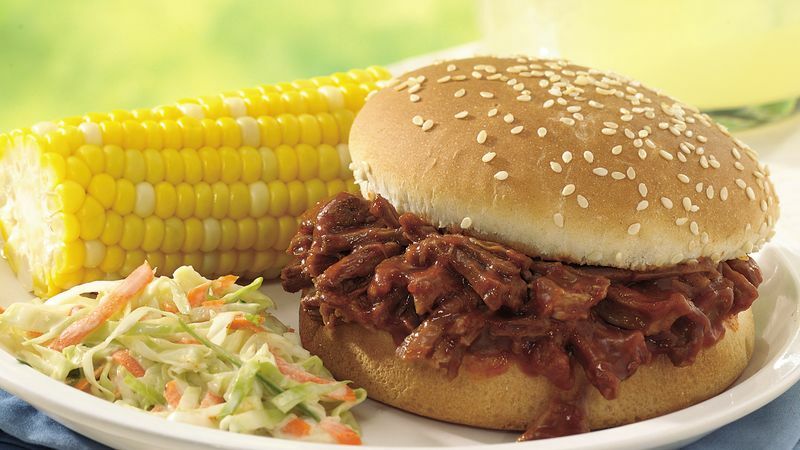 Place beef, pork and remaining ingredients except tomato paste and buns in 4- to 5-quart slow cooker. Remove beef and pork from cooker, using slotted spoon; place on cutting board. Strain liquid in cooker and return cooked vegetables to cooker. Shred meat, using 2 forks. Return meat to cooker. Stir in tomato paste. Increase heat setting to High. Cover and cook 10 to 15 minutes or until hot. To serve, spoon 1/3 cup meat mixture into each bun. When you strain the liquid in the cooker, set some of it aside. If the meat seems a little dry, stir some of the liquid back in. Make up a plate of condiments, including red onion rings, tomato slices and Cheddar and Swiss cheese, so diners can dress their own sandwiches. Don’t forget the ketchup, mustard and pickle relish, too! Make this recipe the day before your gathering and put it in the fridge. Reheat it on the stove just before serving. The meat mixture will hold on your slow cooker's low heat setting up to 2 hours, with occasional stirring.